Found by Don DeSteiguer, the moth was present for two days, both of which were excessively windy. Common throughout the Florida peninsula. Present along the Georgia, South Carolina and Mississippi Coasts. Per Knudson & Bordelon (2004), "This species is vaguely reported from the [Rio Grande] Valley, but we have not seem an authentic specimen." Bratley (1932) (and others) reports its range extending from northern South America, through Central America into Mexico, and from many Caribbean islands. Bratley cited Biologia Centrali-Americana as listing collection locations for this moth from northern South America, however the BCA only mentions Mexico and Belize for Syntomeida epilais. Also, significantly, Janzen & Hallwachs' (2005) database for Guanacaste, Costa Rica contains no records for Syntomeida epilais, but has numerous records for Syntomeida melanthus. Flight Period: On the wing all year in Florida. Similar Species: There are currently eight species in the genus Syntomeida but see Goldstein & Simmons (2005). Four species of Syntomeida reach the U.S. The larvae aggregate for some unknown reason and form pupal aggregations covered by a very thin silk cocoon. Tachinids: Lespesia aletia and Chetogena (=Euphorocera) floridensis and the chalcidid Brachymeria incerta. Bratley, H.E. 1932. The oleander caterpillar, Syntomedia [sic] epilais, Walker. Florida Entomologist 15: 57-64. Druce, H. 1884. Biologia Centrali-Americana. Insecta. Lepidoptera-Heterocera. Volume II . R.H. Porter, London. pg. 333. Goldstein, J.A. & R.B. Simmons. 2005. A morphological revision of the tiger moth genus Syntomeida Harris. (Lepidoptera: Noctuoidea: Arctiidae: Arctiinae: Euchromiini). Poster. ESA Annual Meeting, Fort Lauderdale, Florida. Kimball, C.P. 1965. 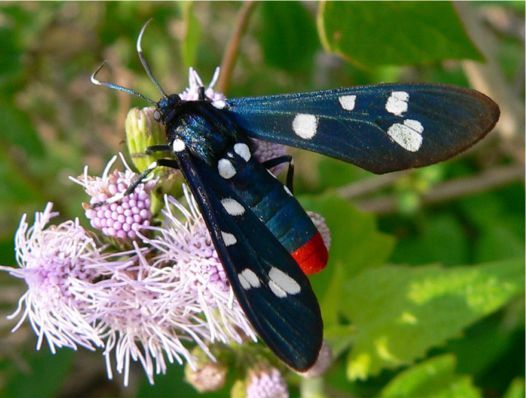 The Lepidoptera of Florida; an annotated checklist. Arthropods of Florida and Neighboring Land Areas, Vol. 1. Florida Department of Agriculture and Consumer Services, Division of Plant Industry. v + 363 pp. McAuslane, H.J., & F.D. Bennett. 1995. Parasitoids and predators associated with Syntomeida epilais (Lepidoptera: Arctiidae) on oleander. Florida Entomologist 78: 543-546. Rothschild, M., J. von Euw, & T. Reichstein. 1973. Cardiac glycosides (heart poisons) in the polka-dot moth Syntomeida epilais Walk. (Ctenuchidae: Lep.) with some observations on the toxic qualities of Amata (=Syntomis) phegea (L.). Proceedings of the Royal Society of London B 183: 227-247. Sanderford, M.V., & W.E. Conner. 1990. Courtship sounds of the polka-dot wasp moth, Syntomeida epilais. Naturwissenschaften 77: 345-347. Sanderford, M. V. & W. E. Conner. 1995. Acoustic communication in Syntomeida epilais Wlk. (Lepidoptera: Arctiidae, Ctenuchinae). Journal of Insect Behavior, 8(1): 19-31. Wagner, D.L. 2005. Caterpillars of Eastern North America: A Guide to Identification and Natural History. Princeton University Press, Princeton, NJ. 496 pp., 1,200+ color photos.